Enjoy Utah! : Fire and Ice at The Shops at Riverwoods - FREE EVENT! Fire and Ice at The Shops at Riverwoods - FREE EVENT! 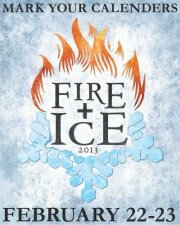 Join us for the first annual Fire & Ice Event! This free event will include ice sculpting, warm fires, fireworks, snowboarding/ski show, live entertainment and more. Riverwoods is pairing with the Food and Care Coalition to offer help to the homeless and low-income individuals of Utah County. For each two cans of non-perishable food donated, s’mores ingredients for one s’more will be provided (limit one s'more per person). Stop by the Riverwoods on Feb. 22-23 to join in the fun! Stay tuned to our website and social media sites for more information! Don't Forget to mark your calendars for February 22-23! !